Rubbish Please prides itself to provide quality and affordable commercial waste collection in London. As a licensed waste carrier, we have all it takes to collect the commercial waste produced by your business. Also, you save money with us. With local teams located all over London, you will get some of the best waste removal prices for your business organization. Contact us today to get a competitive quote for your rubbish removal needs. Our commercial waste collection services are suitable for any business operating in London – retail stores, restaurants, takeaways, hotels, manufactories, shop centres, office building. You can rely on us to get everything running smoothly with the clearance no matter the size of the business. We will work with you to tailor a service that best matches your business needs and requirements. If your company needs one-off or regular waste clearance then Rubbish Please is your number one choice in London. We have a strong team of professionals, so you can be sure your commercial waste is going to be collected quickly at the most appropriate time for your business. When it comes to recycling, rest assured the rubbish we collect is always taken to recycling centres where to be properly processed. Any type of waste produced within the confines of a business is classified as commercial waste and you will need of a licensed waste carrier to dispose of it, otherwise, you risk getting fined. We can also help you with commercial bin cleaning. Food waste is governed by the Animal by Product regulations. Therefore, we collect only food that can go to landfill, such as cooked meat & fish (cooked ham, ready meal, cooked pies), and bakery products (bread, cakes, chocolate, breakfast cereal). We do not collect raw meat and fish, as well as , raw eggs. Food should be properly bagged up and not in messy condition in order to collect it. Bulky items are treated as a “special waste”. These are items too large for bags or bins, and include filing cabinets, chairs, desks, tables, computers, monitors, fridges, microwaves, and other furniture items and white goods. Whether you need standard or special waste disposal, you can count on us to deal with your business refuse in a prompt and efficient manner. A Waste Transfer Note will be provided to you prior collection. 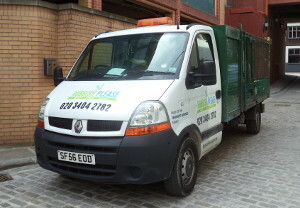 Call now on 020 3404 5556 and let us help you with your commercial waste collection in London.